At Carrfield, every class is allocated one indoor and one outdoor PE slot each week – please see your child’s class teacher for more information about when their PE kit is needed in school. During Year 3, all children also take part in weekly swimming sessions at the Dearne Leisure Centre as well for half the year. Throughout the academic year, children will work on a range of PE themes including Dance, Gym and Sports that develop their fundamental physical skills and their tactical awareness as well as promoting a healthy lifestyle. 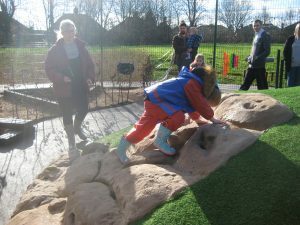 In addition, our Foundation Stage outdoor area provides our youngest children with opportunities to develop their physical skills and lead an active lifestyle in school. As part of our commitment to developing sporting and active lifestyles and to promoting good mental health, we have been working with our strategic partner, Totally Runable. Please click the video below for more information on this exciting project. In addition to their weekly PE sessions, children will sometimes be given opportunities to represent the school in inter-school competitions, many of which are PE related. This includes local Dearne competitions competing against schools such as Highgate, Gooseacre and The Hill and Astrea-wide competitions, such as the Astrea Olympics (held at the English Institute of Sport) and the Astrea Football tournaments (held at Sheffield FC), where we compete against other Astrea schools from the Dearne, Doncaster and Sheffield. 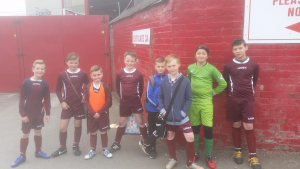 We have also competed in the Bruce Dyer Love Life football tournament which saw our Year 5 and 6 team represent the school in the Final during half-time at Oakwell in a Barnsley FC match. As well as competing against other schools, we are also developing a series of intra-school house competitions with several sports competitions planned for the 2017-2018 academic year. Each child in school represents their house team (blue, green, red or yellow) and will have chance to take part in these competitions which include our summer Sports Day. In addition to the inter-school competitions above, our school football team also compete annually in the long-running Totty Cup. 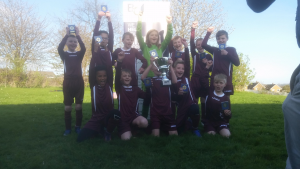 Carrfield has a long, successful history in the Totty Cup – as many of our parents will already know – and the 2016-2017 team did the school proud as they secured the school’s seventh Totty Cup victory. For more information about the Totty Cup – past and present – you can click here. We are looking forward to defending our trophy in the 2017-2018 academic year as we seek to secure our eighth victory. From September 2013 the Government has allocated funding direct to primary schools and academies to improve the quality and breadth of PE and sport provision. Each school will receive £8,000 per annum plus an extra £5 per pupil for each year for the academic year 2014/2015. Schools are free to determine how best to use this funding to improve the quality and breadth of PE and sport provision, including increasing participation in PE and sport so that all pupils develop healthy lifestyles. Please click here for further information about how the school spends and evaluates the impact of the PE & Sport Premium annually.